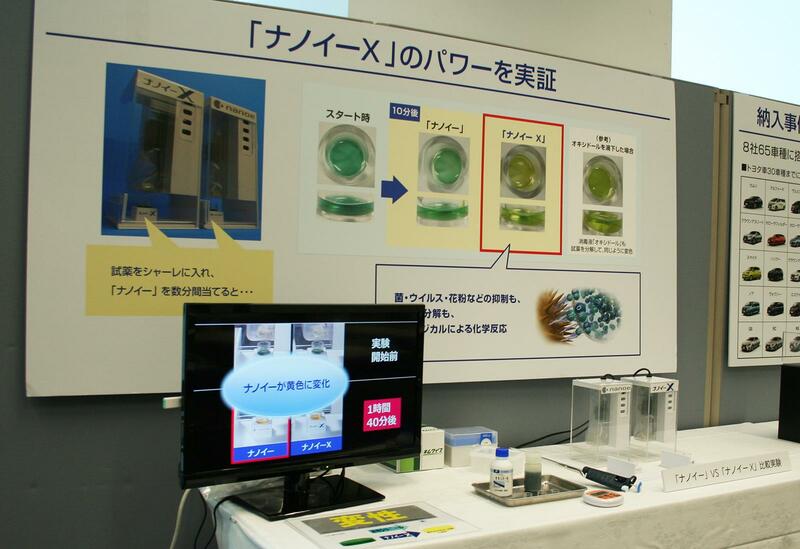 August 2016 - Panasonic Corporation has developed a high performance nano-sized electrostatic atomized water particle "nanoe X" device. 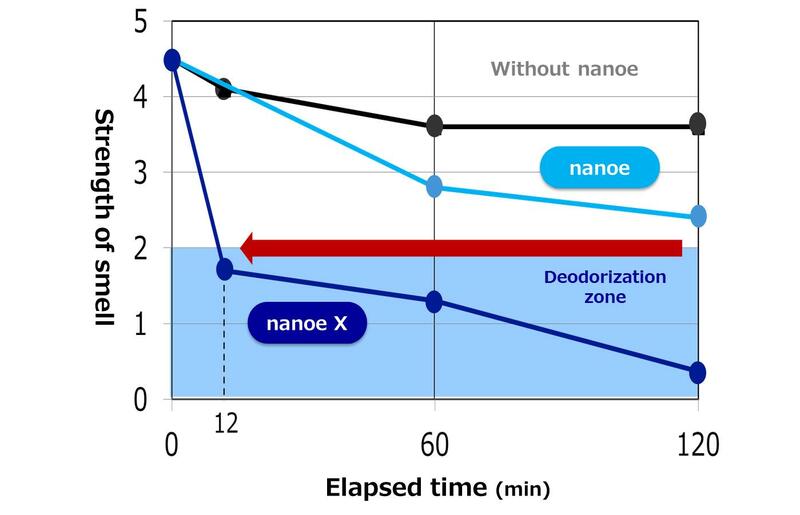 In comparison to "nanoe" devices currently available in the market, "nanoe X" produces approximately 10 times more hydroxyl (OH) radicals, which enhances its ability to purify air and remove odors. 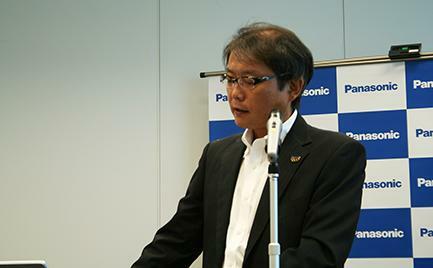 The development of "nanoe" began with Panasonic back in 2001. "nanoe" are nano-sized (1/1 billionth) electrostatic atomized water particles created when applying high voltage to the water gathered from moisture in the air. Couldn't we use water's natural tendency to dissolve odor-causing substances to purify air? - "nanoe"'s development began with this question. "nanoe" approximately 5mm ~ 20mm in size not only reaches deep in fabric and removes odors, but also has approximately 6 times longer lifespan than general negative ion. Since 2003, "nanoe" has become a part of people's lives. It has been adopted in people's homes, public facilities which are desired to improve air quality such as offices, hospitals, and hotels, as well as in transportation such as vehicles and trains. "nanoe" device generates approximately 480 billion highly reactive components known as hydroxyl (OH) radicals per second. OH radicals react to hydrogen (H) contained in pollen, bacteria, viruses, and odor compounds, alter their nature and inhibit them. Then the OH radicals return to air as water (H20). 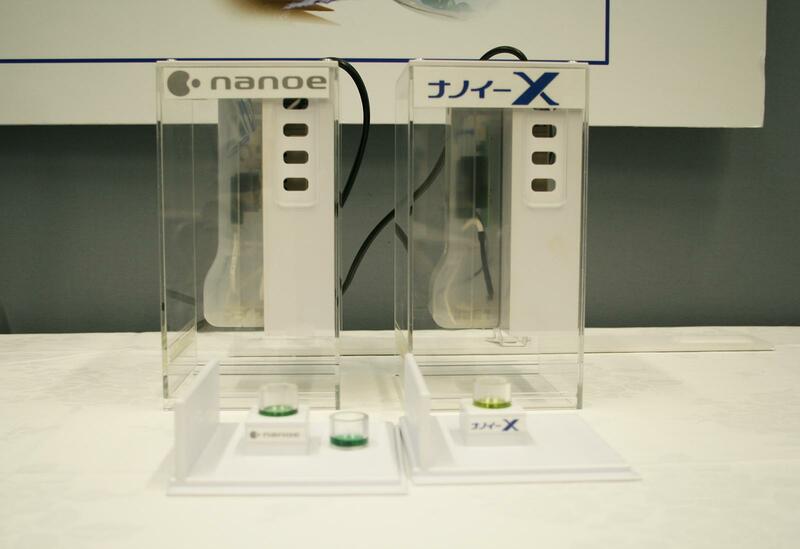 The newly developed "nanoe X" device produces significantly more OH radicals, which improves its ability to inhibit bacteria and remove odors with conventional "nanoe"'s weak acidic nature and long life remained. The new discharge technology has realized this dramatic increase in the OH radicals generated. As mentioned above, "nanoe" is created when high voltage is applied to the water gathered from moisture in the air. "nanoe" generating devices have continued to evolve. It becomes smaller and improves its performance to meet a wide range of needs. Conventional "nanoe" device has the opposite polarity electrode which is the component that generates the "nanoe" particles, was dome shaped. Particles were generated radially from the electrode by "corona discharge". For the new "nanoe X" device, Panasonic co-developed the innovative "multi-leader discharge" system with Professor Yoshio Higashiyama of Yamagata University's Faculty of Engineering. By concentrating the discharge to 4 needle-shaped electrodes, the area in which the OH radicals are densely generated is expanded significantly and the device generates 4.8 trillion OH radicals per second, which is approximately 10 times more than conventional "nanoe" generating device. Principles of producing "nanoe X"
Three effects improved by "nanoe X"
August 25, 2016. 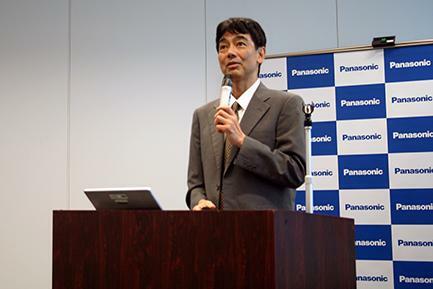 Panasonic organized a technological seminar about "nanoe X". 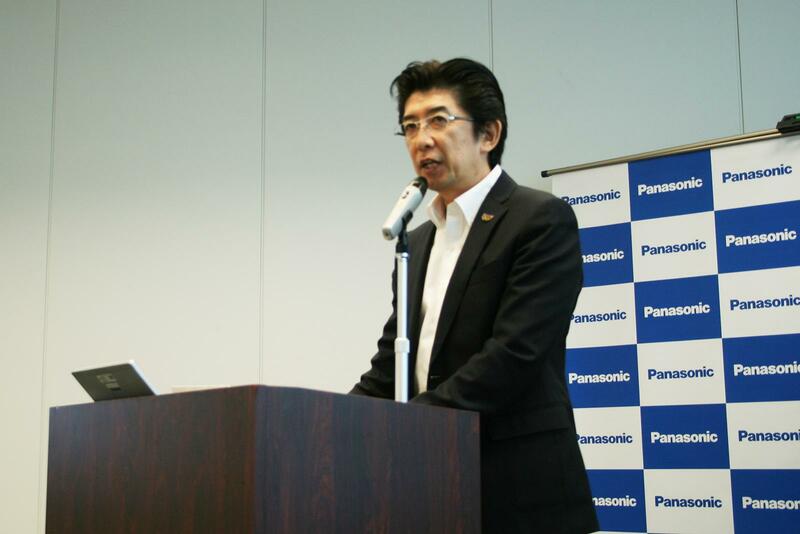 At this seminar, Ryo Motohashi, the director of the Home Appliance R&D Center, Technology Division, Appliances Company, Panasonic Corporation said, "'nanoe' has 3 key features. First, it's 'clean.' It can inhibit virus and bacteria and remove odors. Second, is 'beauty.' It helps retain skin moisture and give skin luster. Third, it helps maintain 'freshness.' The new 'nanoe X' we're introducing today has, in particular, significantly improved its ability to clean." 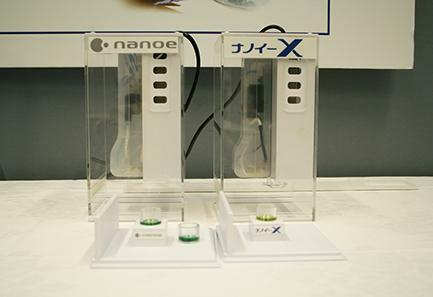 The newly developed "nanoe X" offers 3 new benefits, which all ties into improving air quality. Neutralizes pollen across Japan, all year round. Firstly, "neutralizing pollen." Conventional "nanoe" can only neutralize 4 types of pollen - cedar, cypress, orchard grass, and hogweed, but the new "nanoe X" can inhibit 11 types of pollen including Japanese silver grass, Japanese white birch, and artemisia. As a result, the new "nanoe X" can inhibit pollen in all regions across Japan, all throughout the year. Secondly, "inhibiting other allergens." This includes pet (cats and dogs) and fungal allergies, as well as allergies to ticks, and insects such as cockroaches and moths. According to Professor Masahiro Sakaguchi of Veterinary Medicine at Azabu University, one of the leading researchers of allergens, asthma rates in children has approximately doubled over the past decade. And 90% of these cases may be caused by house dust mites. House dust mites include 2 species - Dermatophagoides pteronyssinus and Dermatophagoides farinae. And "nanoe X" breaks down and inhibits Dermatophagoides pteronyssinus allergens. Verification tests have shown that "nanoe X" inhibits all 17 species of respirable allergens of biological origin as listed in the "View 39" chart below. 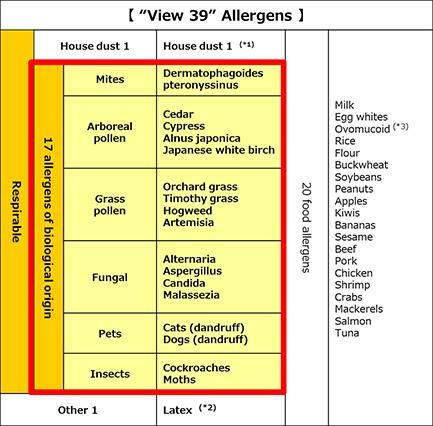 "View 39" refers to a simplified allergy tests that tests 39 allergens that are the major causes of allergic diseases. It is a test frequently conducted at healthcare facilities to help identify causes of allergies. The ability to inhibit all respirable allergens listed in "View 39" means that "nanoe X" can break down major allergens in the air that we breathe in day to day. At the seminar, Professor Sakaguchi, who oversaw these tests stated that "nanoe X" is an effective device for mitigating various allergic symptoms." *1: House dust 1: House dust. 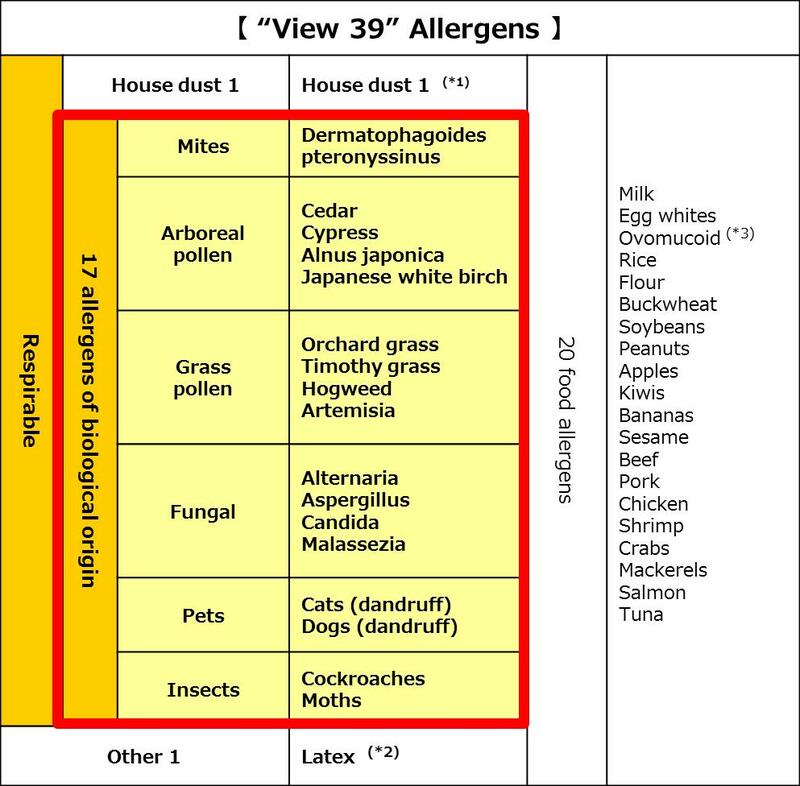 Main allergens are from mites (carcasses, excrement). *2: Latex: Also known as an occupational allergy developed from contact with latex gloves. *3: Ovomucoid: A type of egg allergy. 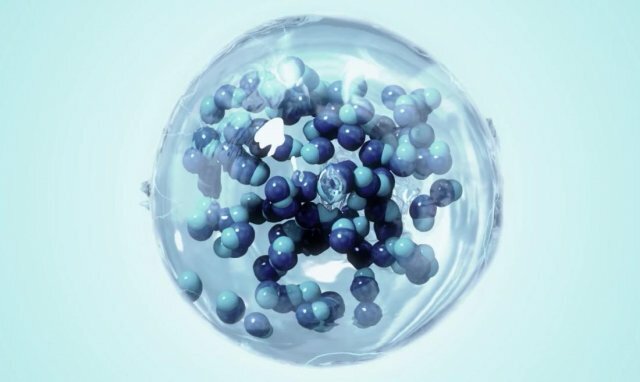 A heat resistant egg protein that retains its allergic properties even when heat is applied. Thirdly, dissolving and eliminating 5 frequently encountered odors. The new "nanoe X" can eliminate bbq smells, and it is approximately 10 times faster than conventional "nanoe," so it can remove bad odors much quicker. 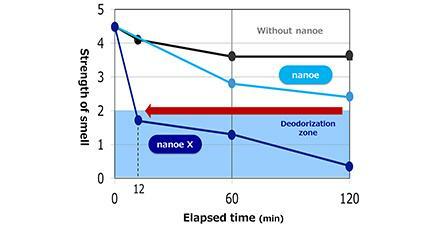 There is higher demand from overseas for deodorization than in Japan, so "nanoe X" will be useful in a wide range of applications. Worsening air quality due to allergens, bacteria, viruses, yellow dust, and PM2.5 is no longer a national problem; rather it has become a global issue. Clean air is essential for our health, and it is a fundamental need that the value we firstly restore when we lose it. In order to mitigate health risks of people around the world, there are many areas where a small device like "nanoe X" can contribute. The device will be helpful in inhibiting allergens, bacteria, and viruses not only in homes, but also in transportation such as automobiles, trains, and public facilities such as hospitals, schools, nursing homes, hotels, and restaurants. "nanoe" technology can be applied in a wide variety of situations and contribute to improve air quality around the world. Tadashi Arimura, the Technology Division Section Chief of the Appliances Company, Panasonic Corporation wrapped up the seminar with the following words, "Panasonic will continue to propose ideas that will help inhibit new allergens and mitigate risks to air quality so that we may help improve people's lives." * "nanoe" and the "nanoe X" mark are trademarks of Panasonic Corporation.